I’ve long admired the Kurds and their continuing struggle for their identity and culture in Turkey and elsewhere against a long policy of ‘Turkification’ since the end of the First World War. I think I first photographed them in October 1999 on the streets of London shortly after the arrest and death sentence (later commuted to life imprisonment) of their nationalist leader, Abdullah Ocalan, the face on many flags, still held in prison on a Turkish island. Since then I’ve photographed many protests they have taken part in as well as cultural festivals, including their New Year festivities and of course London’s May Day march. As well as the protests they organise, they also take part in a wide range of other protests in London. Although their struggles have gained some advances for Kurds in Turkey they are still very much under attack – military and otherwise – from the Turkish government under Islamist Recep Tayyip Erdoğan, who is increasingly pushing through laws and repressing opposition including the Kurds to make himself a dictator. Its a process that has accelerated since the Kurds gained greater representation in the Turkish parliament. While Kurds outside Turkey, have made progress, particularly in Iraq and now Syria where they have achieved de-facto independence, peace talks in Turkey initiated from prison by Ocalan broke down in 2015, since when the Turkish state has tightened its programme of repression and human rights abuses. 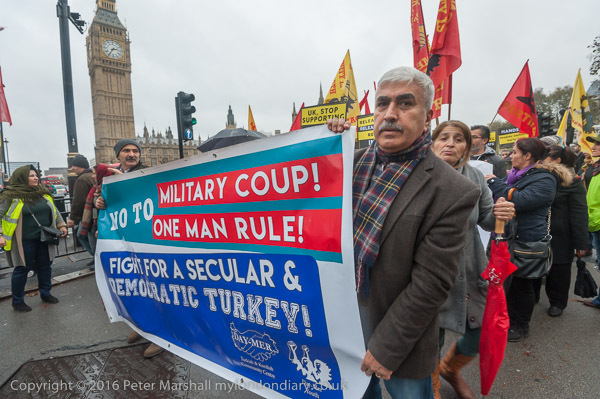 Erdogan used the rather pathetic military coup attempt of 15 July 2016, thought by many to be a ‘False flag’ event, as an excuse to carry out wholesale arrests of his political opponents, including MPs, academics and journalists. 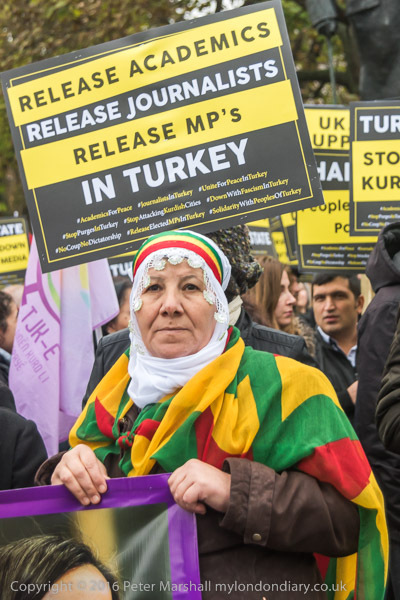 There is a pragmatism about Kurdish protests, and a determination that is missing from many of those more organised events on London’s streets, and an unwillingness to be bound by petty restrictions and bylaws. I don’t think that they ever march along chanting ‘Whose Streets! Our Streets!’ but unlike some other groups that do, it is something they put into practice. I met them in Parliament Square, from where the marched up Whitehall to Downing St, and then on to Trafalgar Square, where I left them. 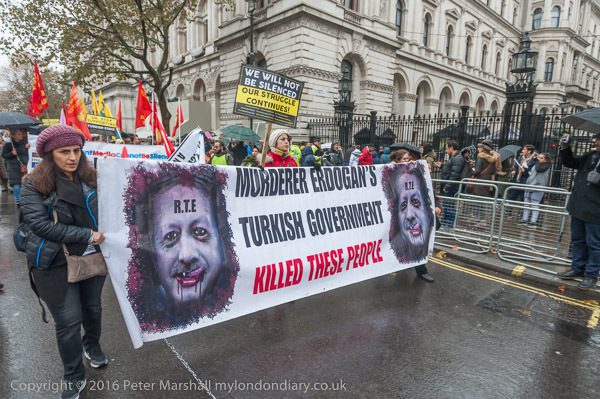 They told me they would perhaps go on to the BBC and from there to the Turkish Embassy in Belgrave Square. But the rain was coming on harder and I decided I’d taken enough pictures in the rain and that it was too far to walk, so I went home. I do get tired rather sooner than I used to. In Syria, in Rojava, a polyethnic community home to many Kurds among others and also known as Western Kurdistan, again thanks to Ocalan from jail in Turkey, Kurds have put in place a remarkable constitution based on a “Charter of the Social Contract” embodying the principles of democratic socialism, gender equality and sustainability. It is a model for democracy while perhaps not perfect in its application makes our own aging pseudo-democratic and class-dominated system look autocratic.